Home Gadgets Uber Expands Self-Driving Car Service to San Francisco. D.M.V. Says It’s Illegal. Uber Expands Self-Driving Car Service to San Francisco. D.M.V. Says It’s Illegal. An Uber self-driving car in San Francisco. A company engineer sits behind the wheel in each vehicle and can take over when needed. 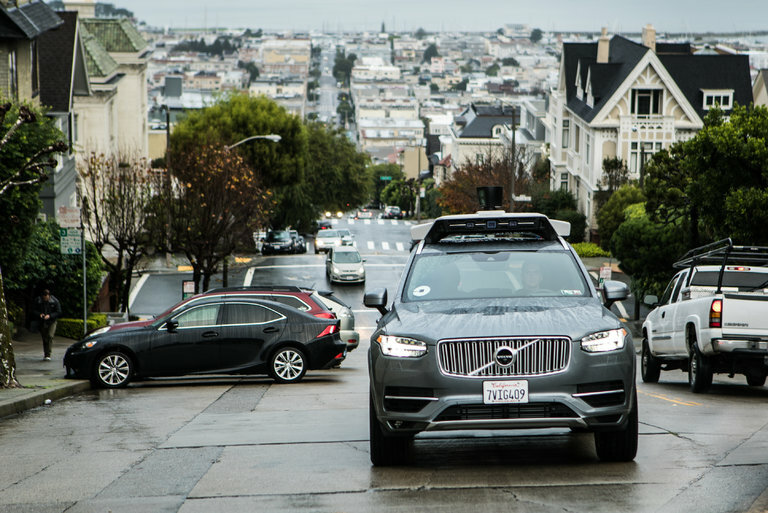 SAN FRANCISCO — Uber made a big splash in its hometown on Wednesday when it started offering self-driving car service to passengers here, making San Francisco the second city in the world where the ride-hailing company provides autonomous vehicles for public use. But California regulators made an even bigger splash late Wednesday when they told Uber to stop the service because it was illegal. The company, the officials said, did not have the necessary state permits for autonomous driving. Uber did not return a request for comment about the letter. The development was an embarrassing twist for Uber, which had set up its San Francisco driverless-car rollout as a big event, especially as it competes with other tech rivals to bring autonomous vehicles to consumers. The debut here, where Uber was founded and has its headquarters, was also a larger rollout in terms of size than in Pittsburgh, where the company introduced its first driverless service in September. Mike Isaac of The Times was among journalists who traveled to Pittsburgh to test Uber’s driverless vehicles. By AINARA TIEFENTHÄLER, MIKE ISAAC and JEFF SWENSEN on Publish Date September 13, 2016. Photo by Jeff Swensen for The New York Times. Even before the service began in San Francisco, questions arose over whether Uber was allowed to test its driverless technology in the city. As of Dec. 8, the company’s name was not listed on the D.M.V.’s website as having a permit to test the vehicles in the state. Companies like Google, Tesla and General Motors all hold permits to test autonomous vehicles in California. When asked, Uber said that it was compliant with all federal and state laws. In California, it said, the motor vehicle department defines autonomous vehicles as those that drive “without the active physical control or monitoring of a natural person.” Uber said its self-driving cars, which require a person at the wheel to monitor or control them, did not fall under that strict definition. The dispute was a reminder that Uber has not expanded its service without regulatory hassles. 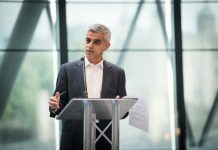 As it has grown, it has run into battles with the authorities worldwide, with regulators often contending that Uber had a dearth of licensed drivers, among other issues. The new driverless car service here also coincided with the debut of the XC90 self-driving car, a Volvo sport utility vehicle outfitted with lidar — a kind of radar based on laser beams, wireless technology and seven cameras. 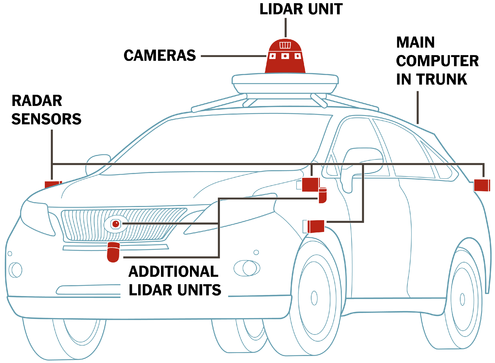 It was produced with Uber’s Advanced Technologies Center, the company’s driverless tech division based in Pittsburgh. Uber and Google both made announcements this week that offer the latest signs that autonomous cars have arrived — and may be driving our city streets sooner than we think. For a while on Wednesday, any San Francisco passenger who requested a ride from UberX, one of the service’s cheaper options, might have been picked up by an autonomous vehicle. They would have received a notification in the Uber app, and could accept or cancel and request a regular driver. An engineer behind the wheel in each self-driving vehicle could take over when needed. Three passengers were able to fit into the XC90 vehicles. 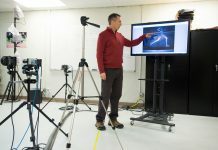 Riders could use with a large touch screen that displayed the car’s route, as well as a rendered version of the environment the car saw through its cameras and laser guidance systems. Uber also let passengers take selfies from a camera facing the back seat, which they can email to themselves and share on social media. Uber wanted to use the expansion of the program to test routes and terrain beyond what it experienced in Pittsburgh. Uber may have gotten more than it bargained for. Shortly after the service began, one of its Volvo XC90s ran a red light, and was caught on camera. The episode raised questions about the safety of Uber’s self-driving technology.